The multi-functionality of the audio devices, and the inclusion of artificial intelligence was one of the main themes in the line this year at CES 2019, and among the many options, one that stood out was the sound bar JBL Link Bar. What is certain is that the bars of sound are generally thin and do not occupy much space, and are a relatively affordable improve the audio capabilities of your tv. The bar JBL Link Bar looks like any other sound bar: it is elegant, and his presence is subtle, with physical controls for volume on the top. What makes it different is that it not only has the intelligence of Google Assistant, but also works with Android TV. In a nutshell, this means that not only is the sound bar you can do everything you can to make a speaker from Google Home, but you can also operate your tv. That would be impressive by itself, but the Google Assistant, which was added to Android TV in the past year, takes things to a whole new level. Using the familiar phrase “Hey, Google“, you can search for movies and tv programs, or watching videos on YouTube. You can also manage your smart home, such as controlling the lights or locks, in addition to playing music, or asking about the weather. One of the best features is that you don’t need to turn on your TV to use JBL Link Bar. If the tv is switched off, the bar only turns on the screen when it detects a visual component in your order; for example, if you say that you want to see your favorite tv program, the tv will turn on automatically, but if you simply ask him for the weather, the tv will remain off and you will hear the response in the same way that a speaker of Google Home. The Link Bar has multiple HDMI inputs and a connection of a single cable to the tv,and switching between devices is done with simple voice commands. It also has built-in capabilities of Chromecast. Once you are connected to the same Wifi network as the Link Bar, you can use any smartphone, tablet, or laptop to view compatible content on the big screen, and not just on your portable device. 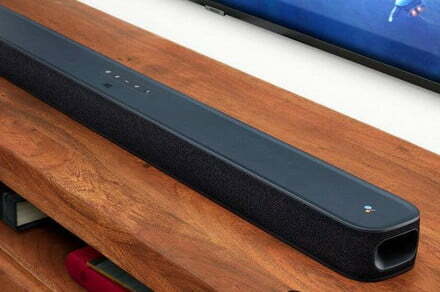 In terms of pricing and availability, the soundbar JBL Link Bar has a price of $400 dollars, and if you want the full experience, an optional subwoofer will cost $300 additional dollars. Will be available in the spring of 2019.